The Leibgarde zu Fuss could trace its unbroken lineage back to the Regiment von Geyso that fought at Lützen in 1632. After the Thirty Years' War it first became the Kassel Palace Company, and then, when the Landgraf Karl formed his standing army in 1684, the Leibgarde zu Fuss. Notwithstanding this pedigree, in the complex 1760 reforms the regiment was redesignated as 3. Garde, being superceded in first place of seniority by a ceremonial Garde-Bataillon. 45. This grenadier provides a good example of the metal-fronted mitre caps favoured by most such units from northern Germany. In this case the front plate was of tin, embossed with the Langraf's cypher and the lion of Hesse. The infill of red paint, seen here as depicted by Knötel, is tenative, but it may have been applied when the caps were first issued and then subsequently polished away. The regiment's musketeers had the usual cocked hats, distinguished by white scalloped lace and red-over-white pompons. Also of interest here are the distinctive dark blue breeches, depicted by the Swiss artist David Morier in his series of paintings executed for the Duke of Cumberland in c. 1748. 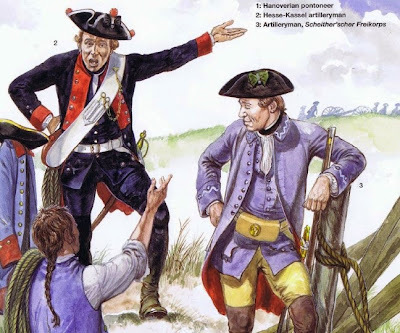 Originally they were worn by all Hessian infantry, making it easy to distinguish them from the similarly dressed Brunswick troops, but there is some uncertainty as to when they were abandoned in favour of the more conventional straw- or yellow-coloured garments being worn by 1761. 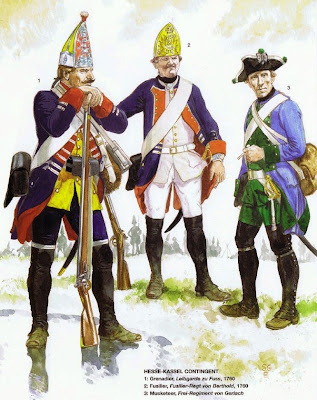 It is possible that this change may have occurred as early as 1750, but it is more likely that it was part of the effort to make the army more Prussian in appearance in 1760. As part of the 1760 reforms two infantry regiments, Von Gilsa and Von Berthold, were redesignated as Fusiliers. The change in status was purely cosmetic, and other than the probable adoption of white or straw-coloured breeches in place of blue the only real alteration in appearance was the replacement of the cocked hat with the distinctive brass-fronted cap depicted here. Copied from the Prussian style, this cap as worn by the Fusilier-Regiment von Berthold had a dark blue 'bag' rather than orange as previously worn by the regiment's grenadiers; the caps worn by the fusiliers of Fusilier-Regiment von Gilsa followed their grenadiers by having bags in the facing colour of crearny yellow. Originally raised in 1683, the then Infanterie-Regiment von Capellan had seen action at Hastenbeck in July 1757; on 5 August 1758 at Mehr the regiment was part of Imhoff's force which repulsed the French attempt on the Allied bridgehead at Rees, and it also fought at Lutterberg on 10 October. The following year it was involved in the debacle at Bergen, when Ferdinand of Brunswick rushed, and botched, an attempt to retake Kassel; it had better luck later in the year at Minden, when it was part of Von Wutginau's brigade, and it went on to fight in 1760 at Emsdorf and Warburg. F3: Musketeer, Frei-Regiment von Gerlach By contrast, very little is known of the Frei-Regiment von Gerlach, reconstructed here from a painting by Richard Knbtel. Other than the obligatory Jäger corps and squadron of hussars Hesse raised very few light troops, in part because the 1760 reorganization meant that nearly all the available recruits had to be pushed into the ranks of the regular army notwithstanding the detrimental effects on efficiency - rather than segregated in auxiliary units such as this. Nevertheless, in 1762 Ferdinand required each of the national contingents to supply a Jäger or Chasseur battalion for a light brigade being formed under Lord Cavendish, and this was the Hessian contribution, originally known as the Chasseur Battalion von Rail. Once again, as in the Prussian Army, their second-class status was indicated by the wearing of coloured waistcoats and breeches, in this case green, rather than the white or straw-coloured breeches sported by regular units. Both gunners and officers of the Hessian artillery wore dark blue coats, waistcoats and breeches, with red collar, cuffs, and turnbacks, black hats with red pompons and white or silver lace according to rank, and black gaiters. Equipment was largely copied from Prussian models, with a broad whitened buff belt supporting a large powderhorn and a drag-rope on the right hip, with loops on the front for prickers. The Landgraf Karl died in 1730. His eldest son Friedrich, then King of Sweden, and nominally Landgraf, was a gallant warrior and lover, but politically insignificant. His brother Wilhelm, Statthalter of Hessen and de facto ruler, continued his father's policy. His aims were to enrich Hessen's military chest with British subsidies, maintain the traditional alliance with Protestant Prussia, already re-affirmed once in a treaty of 1714, and obtain possession of the County of Hanau, promised to Hessen by a treaty of 1648, whenever the existing ruling house should expire. In the War of the Austrian Succession Wilhelm was thrown into a dilemma, for his paymaster Britain was opposed to Prussia and allied with the Catholic Habsburgs, who had not recognized Kassel's right to Hanau and supported a Darmstadt claim instead. A corps of 6,000 Hessians was already serving in British pay when in 1744 Wilhelm supported Karl VII, Bavarian candidate for the Imperial crown, in return for the promise of an Electorship and territorial gains. His support included 6,000 men for Karl's army. Similarly Wilhelm reaffirmed the treaty of alliance with Prussia in 1744. With the fighting going on in Hessan, Hessian soldiers were sorely tempted to make off home to see how wives and sweethearts, or livestock and crops, were faring. In 1762 some 111 cavalry and 2,196 infantrymen deserted out of a contingent of 24,000. The strain of maintaining this large corps fell heavily on the small state. By August 1761 the Landgraf informed Colonel Clavering, British representative at his court, that it would be impracticable to get more recruits if the war continued for another year. Recruiting officers sent to Hamburg, Lübeck and Bremen picked up only deserters and vagabonds, who were no sooner enlisted than they deserted again. The corps could hardly be kept up to strength until the Landgraf was once again master of his own country. Hessian subalterns and rank and file for the last campaign were sixteen- and seventeen-year-olds.